Established in 1865, Fredericksburg National Cemetery is the final resting place for more than 15,000 Union soldiers who died in the major Civil War battles that occurred between Washington, D.C. and Richmond, Virginia. Today the cemetery is a component of the Fredericksburg and Spotsylvania County Battlefields Memorial National Military Park, a National Park Service unit preserving and providing access to the battlefields of Fredericksburg, Chancellorsville, Wilderness and Spotsylvania Court House. The battlefields’ visitor centers feature exhibits, films, and tours interpreting and commemorating the battles in the larger context of the Civil War and American history. Fredericksburg National Cemetery is one of 14 national cemeteries managed by the National Park Service. During the Civil War, the forests, farms, and towns between the rival capital cities of Washington, D.C. and Richmond saw brutal and repeated conflict. The lands around Fredericksburg, which is equidistant between the cities, witnessed four major battles: Fredericksburg, Chancellorsville, Wilderness, and Spotsylvania Court House. More than 100,000 casualties occurred within a 20-mile radius of Fredericksburg. After the region’s bloody confrontations, the remains of approximately 20,000 Union and Confederate soldiers were buried in shallow, hastily dug, and often unmarked graves around the battlefields. Shortly after Confederate General Robert E. Lee’s surrender at Appomattox, the U.S. Congress authorized the establishment of a national cemetery at Fredericksburg to provide a proper burial place for Union soldiers who died at the four major battles, numerous smaller skirmishes, and from illness while camped in the region. War Department officials chose a site called Marye’s Heights, located southwest of Fredericksburg’s historic downtown. During the Battle of Fredericksburg, Confederate troops held Marye’s Heights and successfully repelled numerous Union attacks on the strategic location. Construction of the cemetery and the interment of remains began in 1866. All the burials of the dead from the Civil War were interred in the cemetery by 1869. The Marye’s Heights location influenced the cemetery’s general plan, which follows the natural contours of the landscape to the south and west. At the completion of the burials of the Civil War dead, 15,243 Union soldiers lay in the cemetery, with only 2,473 identified. The cemetery closed to further interments in 1945. Between 1869 and 1945, an additional 300 interments took place of veterans of the Spanish-American War, World War I, and World War II. 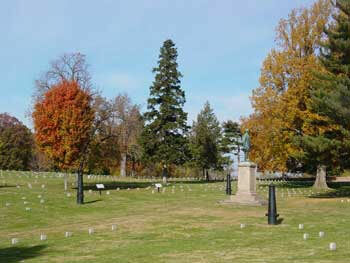 The grounds of Fredericksburg National Cemetery contain a number of monuments dedicated to Union soldiers and officers. Dedicated in 1901, the Fifth Corps Monument honors the service of the corps. The monument to Colonel Joseph Moesch commemorates the officer who was killed while leading his regiment of 83rd New York Volunteers in the Battle of Wilderness. 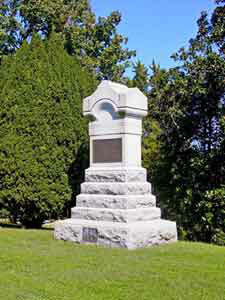 At the center of the cemetery stands the Humphrey’s Division Monument. The monument is dedicated to General Andrew Humphrey’s Division of the Pennsylvania Infantry, Fifth Corps. The men under Humphrey’s command led an unsuccessful attack on Confederate troops holding Marye's Heights, with more than 1,000 soldiers killed or wounded in the engagement. Fredericksburg National Cemetery is adjacent to the Fredericksburg Battlefield Visitor Center, which is located at 1013 Lafayette Blvd. in Fredericksburg, VA. The cemetery is open daily from dawn to dusk. For more information visit the National Park Service Fredericksburg and Spotsylvania County Battlefields Memorial National Military Park website or call the Fredericksburg Battlefield Visitor Center at 540-373-6122. While visiting, please be mindful that our national cemeteries are hallowed ground and be respectful to all of our nation’s fallen soldiers and their families. Additional cemetery policies may be posted on site. The cemetery is one of several components of the national military park, a unit of the National Park Service. Visitor centers at the Fredericksburg Battlefield and the Chancellorsville Battlefield feature exhibits and films on the battles and their significance in the Civil War. The Wilderness and Spotsylvania Battlefields do not have visitor centers, however historians are on site during the summer season and on spring and early fall weekends. The park also includes four historic buildings: Chatham Manor, Salem Church, the “Stonewall” Jackson Shrine, and Ellwood Manor. The National Park Service’s American Battlefield Protection Program provides a brief summary of the battles that today are commemorated by the national military park. The historic residence Chatham Manor in Fredericksburg is the subject of an online lesson plan, Chatham Plantation: Witness to the Civil War. The lesson plan explores the history of the manor, the families who lived there, and how the Civil War affected the Fredericksburg region. The lesson plan has been produced by the National Park Service’s Teaching with Historic Places program, which offers a series of online classroom-ready lesson plans on registered historic places. To learn more, visit the Teaching with Historic Places home page. Fredericksburg National Cemetery was photographed to the standards established by the National Park Service’s Historic American Landscapes Survey.